If you are arrested or issued a citation for any drug crime, then you have been charged with a violation of the state CDS law. This is an abbreviation for controlled dangerous substance and the statute in Title 5 of the state laws includes every type of drug crime on the books. State drug laws include dozens of different types of drugs, and many of these drugs are broken up into different classifications, called schedules. The laws do not include alcohol or tobacco. Without a doubt, the most common drug crime is drug possession, and the most common substance is marijuana. The Herbst Firm’s drug lawyers handle all types of violations from simple possession to manufacturing and trafficking. If you have been arrested or cited contact The Herbst Firm for a free consultation. CDS cases are our specialty and Benjamin Herbst has personally handled hundreds of drug crimes. If you have been arrested for drug possession, chances are that your charge will be listed as CDS marijuana, or not marijuana. The maximum punishment for possession of marijuana is one year for over 10 grams and a civil citation for less than 10 grams. This is much less that the maximum punishment for not marijuana, which is currently a year in jail. Possession not marijuana typically includes drugs such as cocaine, heroin, meth, and ecstasy. It is not uncommon in certain jurisdictions for a first time offender to be placed on reporting probation or even serve jail time for hard drug crimes. If you have been charged it is important to contact a criminal lawyer immediately to begin working on your defense. In a possession case, the amount of the drugs found by police is not relevant to proving a drug crime. You can be charged with possession for having a minimal amount of actual drugs. 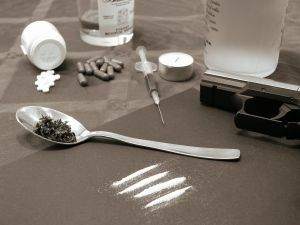 Our drug lawyers have seen drug charges prosecuted for residue amounts of drugs such as heroin, cocaine, and marijuana. A controlled dangerous substance lawyer may be able to negotiate with the state prosecutor to have your drug possession case dismissed, or dropped down to a possession of paraphernalia charge if there is a residue amount of drugs involved, but this is highly dependent on where the arrest occurred in the state. All counties treat these cases differently, and it is important to retain a lawyer who knows the differences between these counties. CDS includes any drug listed in schedule I through schedule V, and also includes other drugs or chemicals that are used to manufacture any listed drugs. Therefore a person can actually be arrested for a drug crime even if they are not found in possession of an actual drug. This type of arrest typically occurs in situations where there is unlawful drug manufacturing that requires chemical substances that are not classified as actual drugs. If you or someone you know is being investigated or has been arrested for drugs, contact The Herbst Firm 24 hours a day at 410-207-2598.